Back for his fourth appearance, Kyle talks about his top 4 things that matter in growing your business. 08:41 – What is the value of your solution? I would outsource over hiring, especially in the start [Click To Tweet]. You’re in the business of getting more clients for your business [Click To Tweet]. Productize your offerings [Click To Tweet]. James: Our next guest I’m going to invite up is Kyle Tully. Kyle, this is the fourth Fast Web Formula in a row that I’ve asked Kyle to come and share some ideas with us and that is because Kyle is an expert at the exact same thing that a lot of us are doing here, which is dealing with business, services, out there consulting, etcetera. And always good information, top of the class, a very, very active contributor to SuperFastBusiness community. So we’re going to hear from Kyle for the next half hour. Alright, I’m going to leave it with you, Kyle. Kyle: Thanks, mate. OK, real quick show of hands. Who’s already doing some kind of local business selling services to other businesses type of thing? Alright and everyone else kind of knows what it’s all about? I’m not talking to newbies here? Yup, alright. So I’m going to skip all the introductory stuff, all the stuff about the opportunity and how much money can you make and all that kind of stuff and just jump straight into the whole business building aspect of it. Everything I’m talking about applies to all types of businesses. So if you’re doing any other type of business, these four steps I’m going to talk about apply to you as well. So don’t think that just because you’re not doing local business, this doesn’t apply to you. So when you’re starting a business, there’s literally a hundred or more things that you can do and if you try and do them all, you’ll go absolutely crazy. You’ll get stuck, procrastinating and never getting anywhere so the whole theme of this weekend is the 4%. So I’ve put together the 4% of things that I’ve seen that actually make a difference in growing a business. The 4 things that matter. 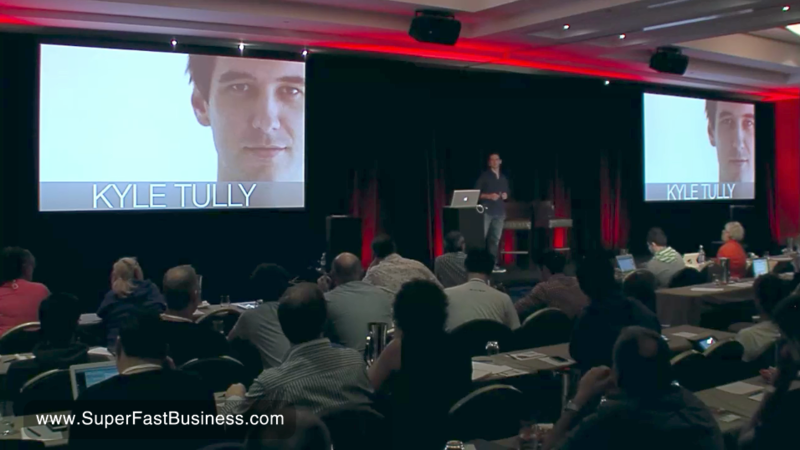 So I went through… I think there was three different trainings I’ve done in the last year or so, and I pulled out all the common bits that we use to regard people’s businesses. Then I went through some of my more recent success stories and we pulled out all the common threads that they had as well. These are the 4 Steps that I’m going to share with you guys today. So the very first thing, the most important thing when you’re starting a consulting business or any type of business is figuring out the problem that you solve. Not being focused on the product that you sell but the actual problem you solve in the marketplace. So the first mistake I see everyone making and even people who should know better is they focus on the product, you know, “I build websites.” As soon as you say that, you sound like every other guy that sells websites. And that’s the perception a lot of people have when you say that. See, you need to get away from these products and services you deliver and focus on the actual problem. So I think there’s a time in this market where you really do need to differentiate or the next year or two, your business is going to die. There’s just too many people out there doing the generic stuff. It’s really time that you need to stand out from the crowd. And the way we do that is via the dirty “R” word: Research. This is another place where I see tons of people completely skipping over research. Instead of actually doing research, they just guess. They just use what’s in their head and say, “Well I think this is what the problem the market’s got so I’m just going to roll with that.” And they spend you know, six months building a business that no one really wants. So your goal with this research is to find a market with a problem that you can solve, hopefully filled with prospects who will actually pay you for that solution. The way I’d suggest you’d start is just pick a market. I’ve put a list out there, called the 47 players of the different markets I’ve worked in, and my students have worked in. That’s a good place to start. You’re looking for things, you know, like a market that spends money on marketing and advertising. Businesses that have sales teams or some kind of sign that they’re using you know, sales and advertising to grow their business. If you’ve got a particular expertise or track history in a market, that’s often a good place to go. Now if you’ve got a current job, maybe going into that industry as a consultant would be an easy way in. And what you want to do is go in there and start conversations with these people and listen for opportunities. Now ask questions and figure out what the problems in that market are. “How do you get clients?” Understand how their business actually works. You’re looking for inefficiencies and places where they’ve been ineffective. “What marketing are they doing?” And how is that marketing working? Is it working at all? “What would their ideal solution look like?” What would be that magic bullet that they’d just love to get? Just asking these five questions will give you such good insights into whatever market you’re looking at going into. And most people I speak to, I’ve spoken to probably 500 people who are involved in a consulting industry in one way or another. Most of them have never asked the market they’re trying to sell to these type of questions. And so what we’re looking for all these questions is a problem that you can solve. This may be something like a way to get traffic to their website or a way for them to be found online. Could be a conversion problem, or one of many, many other things. The key thing is a specific problem that you can solve. Not necessarily you individually, but you as in someone you can outsource to. For example, I’d say 90% of people in my program outsource their SEO services to one of James’ companies. So it just needs to be a problem that you know where to find the solution to. As in they haven’t decided what they’re selling. Is it websites? Is it SEO? Is it pay-per-click? They actually don’t know what their product is and they somehow magically think they’re going to get clients to pay them for something they’re not really quite sure about. So figure out how you would solve the problem. It’s just as important to figure out what you don’t do as what you do do. So you don’t necessarily want to go out there and offer websites and traffic and conversion and emails and video and everything like that because you can’t be the best in all of those things and you’ll spend too much time trying to manage all these different things rather than getting really good at doing one thing. Then you want to figure out what the actual end result that you’re going to provide to this market is. Can you get close to that magic bullet that they said they wanted? What would their life look like once they’ve implemented their solution? People don’t buy SEO but they’ll buy more traffic and more customers and more leads. They’ll buy beating their competitors. So you’re going to figure out the end result that you can actually provide these people. This research doesn’t have to take long. You can do this in a day or two. It doesn’t have to take 6 months. But just these deep thought about your market, their problems and how you can potentially provide solutions to them goes a really long way and you being able to first of all deliver it but also communicate that to the market which is another big problem people have with copywriting. And what’s the value of that solution? You know, what’s the monetary value of it? You could actually sit down and work out what an average client is worth to the people you’re looking to market to over the course of a lifetime. It’s often a lot higher than what you’re charging. I’ve got students who are working with accountants and lawyers and their average client value is $10,000 to $100,000. You don’t need to get very many clients for them to be making a lot of money off the products and services you deliver. So the first step, in my opinion to being able to charge higher prices is you being convinced that what you’re selling is actually worth that much money. So figure out the dollar value of your solution and then figure out some of the intangible values. How much stress are they going to be relieved of by having your solution? How much are you going to get rid of the competition by having your solution? What about if they don’t get your solution? What’s the negative side of things? If they keep going the way they’re going, where’s their business going to be in five years? There’s a lot of markets where 90% of leads and clients are now looking on Google. And so if they don’t have a website and they don’t have a way to get traffic to that website, five years, they’re probably not going to have a business. That’s the end result. That’s going to be the big negative thing that’s going to happen if they don’t buy your solution, if they don’t buy your website or your traffic services. And so the first step is you need to be convinced of this, you need to know 100% in your heart that the best thing these prospects could do is give you $10,000 for a website or buy a $5,000 monthly traffic package. And once you’re convinced of that, convincing other people is actually pretty easy because you’ll be passionate about it. And you’ll have done all these logical research and calculations to present a good argument to them. If you want bonus points, you’ll also want to define your ideal client. Map out what problems have they got? What keeps them up at night? What’s their wife in their ear about, complaining about all the time? And what don’t they like? What beliefs do they have? Now if you’re selling SEO services and you’re selling SEO to accountants, what do accountants believe about SEO? What’s their perception of the market? Knowing this gives you huge insights into how to sell to these people into where you need to enter the marketing space in terms of educating them. How sophisticated are they? How much do they know about SEO? How much do they think they know about SEO? The big Ah-ha idea here that many people completely dismiss is that your clients may not be who you would assume they are or who you want them to be. We all kind of just naturally tend to think that our clients are kind of like us. They kind of think the same way we do. They kind of know about what we know and most of the time they’re not. Unless you’ve been an accountant for 20 years then you go into the consulting to the accountants market, unless that’s the case, most of the time, your clients aren’t going to be like you. So the most important thing you can do is Do The Work. Actually sit down and do this research. Spend a day or two days or a week interviewing people in the market. Some of the most invaluable time you can invest in your business and that goes for any market, any nation or any industry you are in. Doing this kind of research and doing it regularly as well. Go back every 6 months or so. Interview people. Find out more. Survey your existing clients. Make sure your answers to all these research questions I have been proposing are coming from the actual work you have done from the research and not from up in your brain. So, second step is you need to generate leads. Goes for pretty much every business out there, you need a way to generate leads. And the goal is pretty simple, you want your interested prospect to raise their hands so you know who to spend time and money and resources marketing too. Let’s say, probably, the fundamental problem I’ve seen in the consulting businesses or people who are just starting a consulting business, is they haven’t actually decided on a way to get leads in the door. They’re kind of pretending they got the business and they’re buying products and looking around and sorting all out their outsource providers. But they haven’t put up a system in place to get leads into the business. We’re going to look at a bunch of different strategies. I’m not going to spend too much time on the actual strategies. One, because we’ve only got 30 minutes together. And two, we simply couldn’t go into enough depth on them anyway. The important thing to know is that they all work. Every single one of these works. The first one is Personal Networks. Go to the people you already know. It’s really surprising sometimes who your friends know, or who your current boss knows, or who you know through existing relationships you’ve got. Many of our students come in and had no other lead generation other than going to their personal networks. And they’ve been able to switch from a full time job to a full time business just by leveraging these networks. Networking is still working really well for a lot of my clients, really, really well. Because you can go in there and it’s like you’ve got this own little market of your own to play with and to just sell to. And the way a lot of these networking events are set up is that they can be, for example, one SEO guy for the group and one website guy. Once you are in, you can kind of lock it down. You’ve got a group of 10 or 20 people you can first of all sell stuff to, and also have referrals and stuff coming in from. So networking is still working really, really well. Newsletters and reports are also working great, same with direct mail. We kind of integrate all three of these, many times. And more recently, people have been experimenting with the OTR strategy, James’ Own The Racecourse type of thing. We are putting content out in the marketplace. We are delivering high value reports. We are writing a monthly newsletter. We are putting out weekly video tips, educating people on why they need a new website and why they need SEO, why they need traffic and conversions. The sale happens much more naturally once you have done that. My main advice here is just pick one. Just pick one strategy and actually execute it. There’s no point knowing about 20 different strategies. There’s no point spending $7 a day on the latest greatest strategy if you still haven’t implemented the first one. So pick one and just roll with it and execute it and get good at it. And the way you pick, figure out what are your strengths. What are you good at? What is your expertise? Are you a great copywriter? Are you good on video? Are you a great personal one-to-one sales person? Can you sell them a phone? Figure out what your strengths are and leverage them. Don’t just go down one path because someone else said that worked for them. Lots of good solid takeaways- thanks Kyle and James. Get your USP down, because you do need to differentiate. Stop trading hours for money, as time is a finite resource and without products and systems- you cannot scale a business. Hello James, great stuff. But where can I find the list of 47 players of the different markets?